Visit Monastery of Arkadi and Ancient Aptera for their historical value. Do some cultural sightseeing at The Venetian Fortezza and Monastery of Panagia Chalevi. 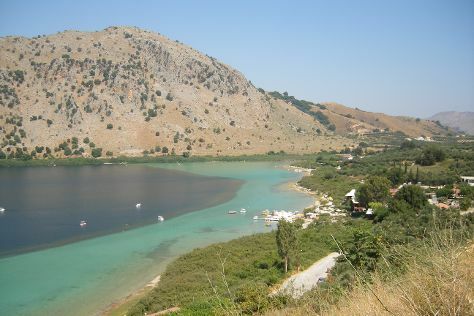 Explore the numerous day-trip ideas around Rethymnon: Preveli Beach (in Lefkogia), Lake Kournas (in Kournas) and Agia Marina Beach (in Agia Marina). There's still lots to do: take a stroll through Rethymnon Old Town, take in the spiritual surroundings of The Monastery Arsaniou, and stop by mariannas. For photos, where to stay, more things to do, and other tourist information, use the Rethymnon trip itinerary builder app . If you are flying in from Austria, the closest major airports are Chania International Airport, Heraklion International Nikos Kazantzakis Airport and Santorini Airport. In April, daily temperatures in Rethymnon can reach 24°C, while at night they dip to 14°C. Finish your sightseeing early on the 22nd (Mon) to allow enough time to travel back home.